WAUKEGAN, Ill. (May 16, 2016) – Precision Laboratories recently announced results from a series of studies that show the important role that ToleroTM, an irrigation injection surfactant, plays in the performance of soil-applied products such as nematicides, fungicides and herbicides. WAUKEGAN, Ill. (June 19, 2015) – Water insecurity, regulations and increased demand, in combination with an increasing population, makes it more critical than ever for growers to feed the world with less water and energy. 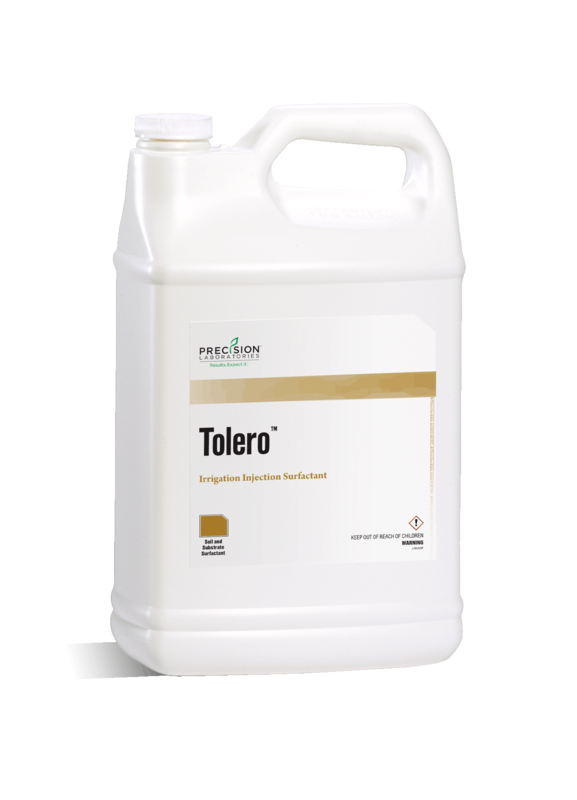 To address these concerns, Precision Laboratories introduces TOLEROTM, an irrigation injection surfactant proven to increase crop yields while reducing irrigation water and the energy needed to move it. Waukegan, Illinois (Nov. 1, 2013) – Precision Laboratories has released a major update to Mix Tank, the award-winning and patent-pending app for iPhone and Android smartphones. With a new, simplified design, Mix Tank 3.0 features Mix Sheets™, a feature that captures product use rates, field size, spray volume and tank size. Mix Sheets capture rates per acre, per load and per field. Full details of the latest mobile application updates are available online at www.precisionlab.com/mixtank. Waukegan, Illinois (October 23, 2013) – Growers, retailers, golf course superintendents and other users of Precision Laboratories’ product solutions now have an opportunity online to share and submit their user experiences and provide peer feedback. Through the online testimonial submission form now live at www.precisionlab.com/testimonial, users can share their stories of how Precision Laboratories products help increase efficiency and performance in their operations. Waukegan, Illinois (October 17, 2013) – Episode Two of the TridentTM Bio-Inducer Virtual Plot Tour is now available. Performance-minded soybean growers are again invited to join Dr. Rob Osburn, Precision Laboratories’ technical manager for Seed Enhancement Products, near the Sparta, Ill., test plot to see how nitrogen optimization promotes season-long performance and a yield advantage of six percent or more. Waukegan, Illinois (September 10, 2013) – Farmers and crop consultants have a new option for instant access to current Precision Laboratories’ product label information. As a manufacturer partner of Agrian, Precision Laboratories will now receive priority indexing on the Agrian Label Lookup database. WAUKEGAN, Illinois (September 3, 2013) – Growers and consultants now have the opportunity to watch online as Trident™ Soybean Bio-Inducer, from Precision Laboratories, helps an Illinois soybean crop maximize its growth potential and nitrogen nutrition. Waukegan, Illinois (August 20, 2013) - Managing drift takes more than throwing a drift control adjuvant into the spray tank. Various factors, including airplane speed, droplet size, wind and nozzle type all play a role in making sure a product reaches its target. Waukegan, Illinois (June 25, 2013) – Precision Laboratories recently announced the expanded label of Volare DCTM to now include Washington registration. Volare DC delivers improved drift control, deposition and coverage when applied through aerial application equipment. Waukegan, Illinois (June 11, 2013) – Precision Laboratories is pleased to announce the expanded label for Elimino™ and Vestis™ to now include California and Washington registration. Elimino and Vestis are adjuvants certified by the Organic Material Review Institute (OMRI).